Recession, damp, shorter days and soaring unemployment: there's precious little to cheer Britons this fall. Luckily, a rollicking tale of a Labour grandee and a toffy Tory involving the betrayal of secrets and the lure of obscene wealth is adding considerably to the nation's gaiety as each day brings fresh revelations about a series of encounters that took place on and around the Greek island of Corfu this summer. Heading the cast is Peter Mandelson, the co-architect of New Labour, recalled by Prime Minister Gordon Brown at the start of October from his post as E.U. Trade Commissioner, and installed in the House of Lords as Baron Mandelson of Foy and Hartlepool to serve as Business Secretary. Sharing top billing is George Osborne, the Conservative Party's azure-blooded Shadow Chancellor, a cherub-cheeked 37-year-old son of a Baronet. Their interactions with each other and with Nathaniel Rothschild, scion of the eponymous banking dynasty, and Rothschild's friend and business associate Oleg Deripaska, a reclusive oligarch routinely described as Russia's wealthiest man, took place aboard Deripaska's super-yacht and in other opulent Adriatic locations over a long weekend in August. Throw in cameo appearances by Rupert Murdoch and his daughter Elisabeth, and the Corfu capers are proving the perfect distraction from Britain's credit crunch woes. A month ago Labour and the Conservatives pledged cross-party cooperation to shield Brits from the economic crisis, but nobody ever imagined it would take this form. In fact, while the parties may be jointly lifting the national mood, the bipartisan spirit burns no brighter in Westminster than in Washington. Even as they declared a truce over the financial meltdown, British pols were trading blows. 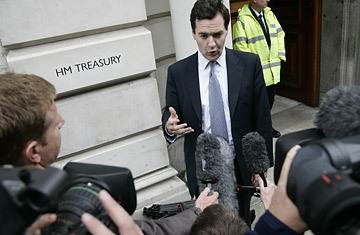 "We meet at a time of national anxiety," Osborne told delegates at the Conservative party conference on Sept. 29. He asserted that his party was determined to make rich bankers pay for the mess they had helped to create. "Unlike New Labour we are not bedazzled by big money," he said. But Osborne, born to affluence that might have been expected to inoculate him against the glint of gold, hardly seems immune himself. Five weeks before his speech to the Conservative conference, he had enjoyed the hospitality of Rothschild, an old university chum, in Corfu and attended, with Mandelson and a heady mix of the powerful and the outrageously loaded, Elisabeth Murdoch's 40th birthday dinner on the island. That's exactly the sort of high life former Prime Minister Tony Blair notoriously enjoyed during his tenure in Downing Street. Blair's vacations with well-heeled new best friends, from Italian media magnate-turned-premier Silvio Berlusconi to Robin Gibb of the Bee Gees, played badly back home. But how much worse it looks for high-born Osborne in this new age of austerity when Tories are desperate to prove themselves in tune with the Man on the Clapham Omnibus  that's Britspeak for Joe the Plumber. The irony is that nobody would have been any the wiser if Osborne had not leaked the content of a private conversation with Mandelson to a journalist. Mandelson, he said, had "dripped pure poison" about Blair's successor, Brown. In the normal course of events, that would scarcely have merited a paragraph in the British press. Mandelson and Brown had been embroiled in bitter feuding since the mid 1990s, when Mandelson backed Blair over Brown for the Labour leadership. But Brown's surprise move to recall Mandelson to government trained the spotlight back on their relationship. The leak also awakened interest in Mandelson's dealings with Deripaska, a controversial figure whose multi-entry visa to the U.S. was revoked by the State Department in 2006. Mandelson and Deripaska have known each other for several years. Although invited to Corfu by his close friend Rothschild, Mandelson stayed on the oligarch's yacht because Rothschild's villa was full. In his E.U. post, Mandelson was theoretically in a position to assist the Russian's business interests. He angrily denied any impropriety in an interview with the BBC. "There has been innuendo in the newspapers that I gave favors or I gave benefits as Trade Commissioner to individuals because of my personal friendship with them," he said. "The entirety of the European Commission, the Director General for Trade himself has made clear that there is not one jot of truth in that." Mandelson twice served in Blair's Cabinet and twice resigned over imbroglios with rich men. He stood down in 1998 after taking a loan from a millionaire colleague to buy a posh house and left government a second time in 2001 after claims, fiercely denied and later dismissed by an enquiry, that he improperly intervened to help a mega-rich Indian entrepreneur seeking British citizenship.